Traditional Italian Vanilla Panna Cotta with Raspberry Coulis is one of my favorite desserts and very easy to make on plan by just switching out the sweetener to a plan-approved one. However, since it’s made from heavy cream, it can be an abuse of calories by indulging in it too often, and since it’s a Heavy S, it can only be enjoyed in an S setting, unless you want a Crossover. Heavy cream also causes acne for me, so I had plenty of incentive to lighten up my favorite dessert! This Fuel Pull Vanilla Panna Cotta with Raspberry Coulis is low-carb, low-fat, high in protein, and can be enjoyed with any meal! Aside from setting time, this Fuel Pull Vanilla Panna Cotta with Raspberry Coulis only takes 10 minutes to make and doesn’t require any special ingredients. You can use any berry to make the coulis, but I think the tarter raspberries complement the sweet, creamy panna cotta the best. The two flavors are so good together! Alternatively, you could make a compote out of any favorite fruit (I’m thinking peaches would be delicious!) and turn this dessert into an E! 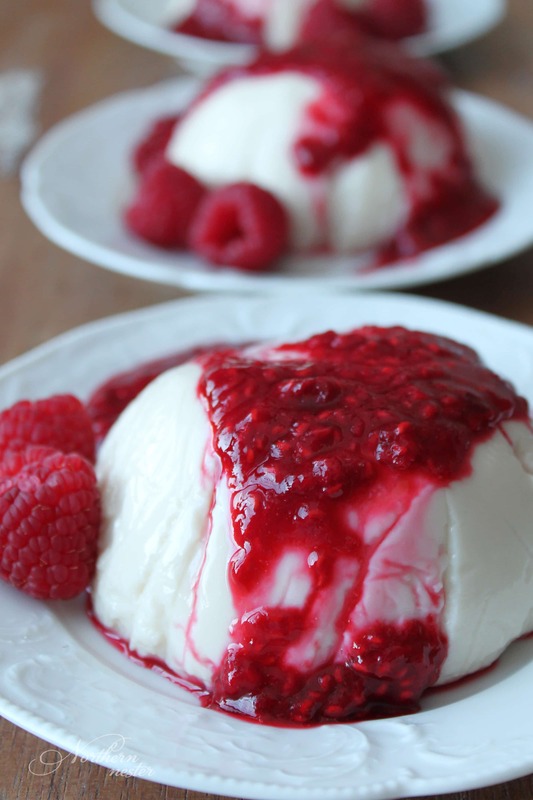 This Vanilla Panna Cotta with Raspberry Coulis makes 4 servings. They keep well in the fridge, for a convenient dessert or snack, or half the recipe for a romantic dessert for two! This low-carb, low-fat, gluten-free, high protein Trim Healthy Mama Fuel Pull proves that indulging in dessert doesn't have to be fattening! A delicious end to any meal, no matter what the fuel type. Line 4 ramekins, small bowls, or glasses with plastic wrap. In a medium saucepan, whisk and heat cashew milk, xylitol, and mineral salt together until sweetener is dissolved. Meanwhile in a small bowl, sprinkle gelatin over water to soften for 1-2 minutes. Scrape softened gelatin into hot cashew milk mixture and whisk until completely dissolved. Remove from saucepan from heat. Stir in yogurt and vanilla until smooth. Pour into prepared dishes. Refrigerate for at least 3 hours. Invert onto a plate and remove plastic wrap. To make the raspberry coulis, bring raspberries and sweetener to a boil in a saucepan. Remove from heat and whisk in xanthan gum. Cool in fridge for 5 minutes before pouring over each panna cotta. Unsweetened almond milk can be substituted for the cashew milk. Any frozen berry can be used in place of the raspberries. For an E dessert, you can enjoy this panna cotta with any fruit. Do you think these would set up the same in a mason jar if you weren’t worried about presentation? Great! Very easy to prepare yet looks so yummy! Thanks for sharing! Can I use a different natural sweetener? Does the xylitol need to be in a powdered form (in a blender)? Also, could you use Pyure in place of the Gentle Sweet? Again, in powdered form.. Does the xylitol need to be in a powdered form (in a blender)? Also, could you use Pyure in place of the Gentle Sweet? Again, in powdered form. This was a big hit with the family! Loved the ease of making it. This is going to be a staple in our house. For those asking in the above comments, I didn’t powder the xylitol. It totally dissolved in the milk.